With UConn, Maryland Wins, Women's Final Four Has 4 Top Seeds And A Familiar Look Connecticut is back for the eighth straight year, Notre Dame for the fifth and Maryland returns for a second straight year. South Carolina is making its first appearance. 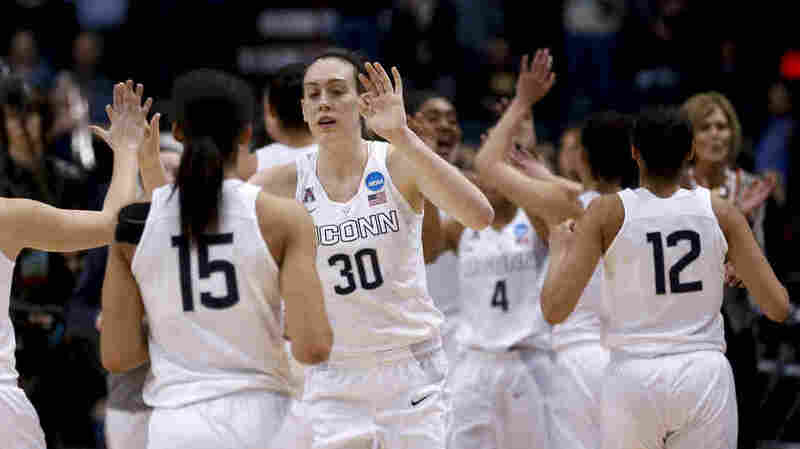 Raise your hand if you're not bored with winning: Connecticut's Breanna Stewart and teammates celebrate their 91-70 victory Monday over Dayton during a regional final game in the NCAA women's college basketball tournament in Albany, N.Y. The victory sent the team to its eighth straight Final Four, where it will pursue its third straight title. The women's Final Four will have a familiar feel to it with three of last year's teams back in the national semifinals. It's the third time in the history of the Final Four, following 2012 and 1982, that all four of the top seeds made it this far. 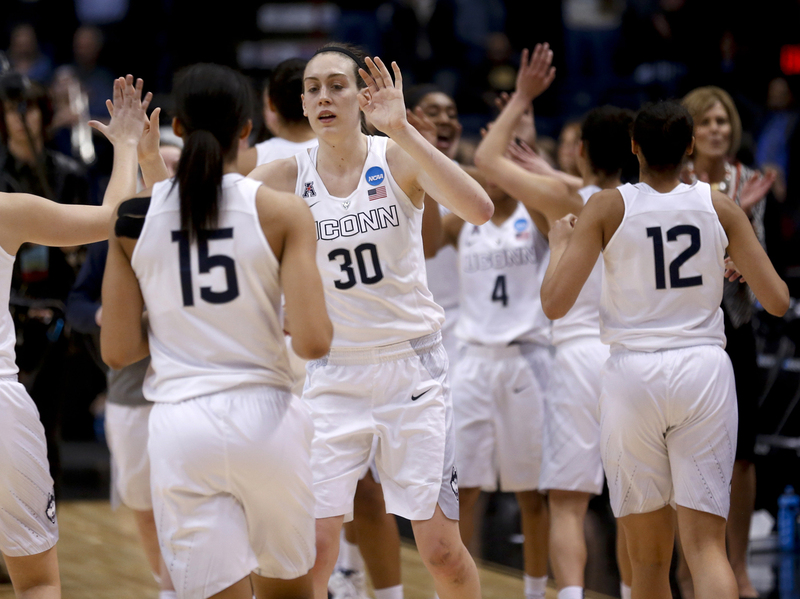 "That's the way it is in women's basketball," UConn coach Geno Auriemma said. "The absolute best teams get to the Final Four. I'm not one bit surprised Notre Dame and South Carolina are there. That's the way it is in our game. The best teams go to the Final Four every year." The Huskies will be trying for their third straight national championship and 10th overall, which would move Geno Auriemma into a tie with vaunted UCLA men's coach John Wooden for the most all-time. UConn will face Maryland and Notre Dame faces South Carolina on Sunday in Tampa, Florida. Gamecocks coach Dawn Staley will become the second person to both play and coach in the Final Four, joining Baylor's Kim Mulkey. "We are not just going to show up and just be happy to be there," Staley said. "This particular regional final game isn't the destination game for what we set out to do this season. "So, you know, I think this was a statement game because we are going to — we punched our ticket into the Final Four and now it's time to maybe check off some things that we've wanted to do, which is win the national championship." "We have been there a number of times and not been able to finish," Notre Dame coach Muffet McGraw said. "Each year, we feel like maybe this will be our year, but I think (we're) definitely celebrating this whole week of what we accomplished all year long because only one team is going to win."